This can be a very useful tool. Please check with the Guidance Office for directions on how to access your account. We use this site to practice math concepts covered in our math curriculum. While students work on this site, they are practicing previously taught skills and they are introduced to new math skills. Students have video support that demonstrate how to do the new skill along with hints that help guide students to working toward the correct answer. Each student has their own log-in and password. This is a free site that anyone can use. 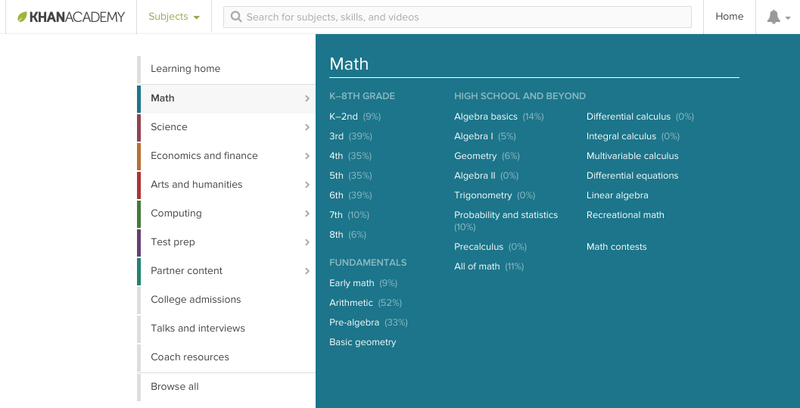 Below are some of the math learning opportunities with Khan Academy. Notice that there are leaning opportunities for many other disciplines from Science to Test Prep. This is a web based site that uses our student data from the MAP test taken at the beginning of the year. It assigns practice according to the weaknesses found in each area of Number Concepts, Algebra, Geometry and Probability and Sample Space. There is a log in and password for this site. Check with your child's teacher for this information. This is a free web based site that uses the Common Core Standards to practice skills in mathematics. You will have to set up a log-in and password. The standards are very similar to the Minnesota State Standards.